How we pay doctors through our public health system is an important issue that receives little public scrutiny, despite the fact that physician compensation represents a significant share of the provincial budget and has been among the fastest-growing health care costs in recent years. There are two main physician payment models in BC. The majority of physicians receive government payments under the fee-for-service model, essentially working as independent contractors who bill our public insurance plan (the Medical Services Plan or MSP). Under fee-for-service compensation, physicians bill MSP for each service provided (each has a separate billing code and a rate negotiated between the Ministry of Health and Doctors of BC). According to the Auditor General, in 2011/12 fee-for-service payments totalled $3 billion.3 The fee-for-service funding stream differs from how public funds are allocated for the majority of other health care providers, largely because most are compensated under negotiated collective agreements that provide government with certainty about expenditures over the life of the collective agreement (often 3–4 year terms). But since fee-for-service payments do not have a maximum cap in any fiscal year, this compensation model poses challenges to effective planning and management of public health care spending. Similarly, a 2011 Canadian Institute for Health Information (CIHI) study found that physician compensation was among the fastest-growing drivers of health care costs over the previous decade (1998-2008). Indeed, physician pay increased by an average 6.8% per year over that period, far outstripping the gains for other workers in health and social services.9 A little more than half of this increase (3.6% per year) was attributed to growth in fee-for-service billing schedules. The above figures do not reflect the overhead costs many physicians must pay (such as for leasing clinic space and paying staff)—an issue discussed in greater detail below. Nevertheless, there is a wide gap between the incomes of physicians, other health care providers and the average BC worker, which contributes to the troubling growth of severe income inequality. Ironically, we know from a large body of evidence that rising inequality is directly connected with poor health among lower-income groups and higher public health care costs (e.g. increased rates of hospitalization and chronic disease), among other societal problems.11 Instead of helping improve health, high physician pay is contributing to the larger problem of inequality. 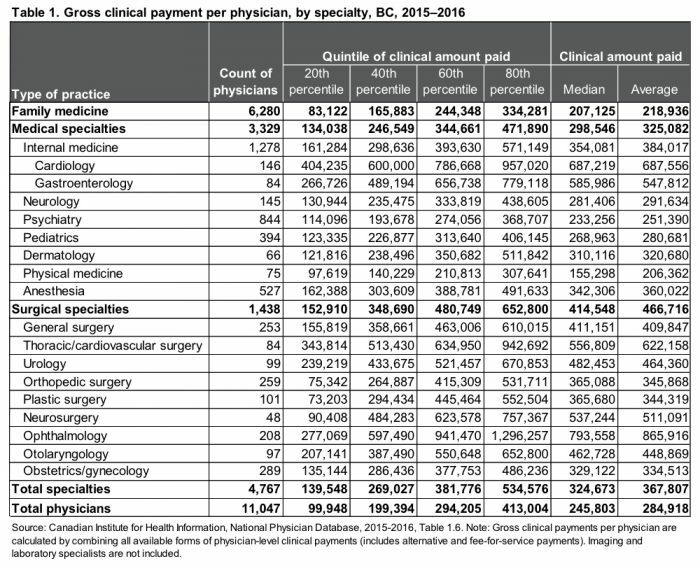 Another important issue is the wide gap in earnings between family physicians and specialists in BC (see Table 1).12 The difference between the average clinical amount paid to a family physician ($218,936) and the average specialist ($367,807) is nearly $150,000. The difference in earnings is greatest between surgeons and family physicians, with the average surgeon earning more than twice the average family physician. In some specialty areas, ophthalmology in particular, the gap in clinical payments is stunning. An ophthalmologist in the 80th percentile will gross nearly $1.3 million per year—more than six times the average family doctor. The list of the top 100 highest-billing physicians in 2015/16 illustrates this divide.13 Among these practitioners, 97 were specialists, with ophthalmology (62) the leading practice area followed by cardiology (20). MSP payments to the top 100 highest-billing physicians ranged from $1,051,859 to $3,306,401. Physicians have access to a number of tax loopholes that are not available to most Canadians and that disproportionately benefit high-income earners. Alberta and BC lead the country in physicians’ use of medical practice incorporation through a “Canadian-Controlled Private Corporation” (CCPC). In 1996, 44.2 per cent of BC physicians in private practice were incorporated. By 2011, this had jumped to just over 70 per cent.19 A recent study on the use of CCPCs found that, on average, “incorporated physicians realized a four per cent reduction in personal income taxes and accumulated retained earnings of at least $10,000 annually in their CCPC from 1996 to 2011.”20 The financial benefits of incorporation stem from retained earnings and income splitting. Some positive changes to income splitting last year by the federal government have reduced the amount of tax avoidance possible. Third-party billings are another significant income source for physicians, which include WorkSafeBC clients, ICBC clients and services billed to the Armed Forces, Corrections Canada and the federal Refugee Health Program. Extra-billing is also not captured in payments from the provincial government. BC has developed an unfortunate reputation due to some physician- and investor-owned clinics charging illegal out-of-pocket fees to patients in exchange for faster access. A 2012 BC government audit found extensive illegal extra-billing and overlapping claims to MSP by Brian Day’s two for-profit clinics (Cambie Surgery Centre and Specialist Referral Clinic). In 2017, a Globe and Mail investigation found “hundreds of examples of extra-billing and double-dipping by BC doctors in provincial audits…” A March 2017 internal government memo, released under Freedom of Information, reveals how pervasive the issue may be. By August 2017, the new BC government announced three private clinic audits in order to investigate suspected violations of the Canada Health Act and prevent the claw back of federal health care funding (for every dollar of extra-billing, the Province loses a dollar in federal funding). The memo states that an additional seven private clinics are awaiting audits for potential extra-billing dating back to 2008. The reason these audits were not conducted is redacted, but internal Ministry of Health resourcing to conduct the audits appears to be at issue. In Scotland, for example, a new contract for general practitioners moves in a promising direction by gradually taking the burden of overhead and ancillary expenses away from doctors and introducing a population-based payment model (called capitation). In time, this approach will allow for much greater clarity between government and the medical association when negotiating compensation. It will seek to eliminate uncertainties and disagreements that arise when negotiating overhead costs, which can vary considerably between physicians and practice location. However, we are making progress in BC. The provincial government has recognized the limitations of fee-for-service physician remuneration and the growing preference of new medical school graduates for alternatives.25 Last May, the BC government announced opportunities for 200 recent family medicine graduates to work under a new compensation model. The success of this initiative will depend in large part on shifting towards evidence-based non-profit primary care models—such as Community Health Centres26—that can provide physicians new opportunities to work with a team of health care providers, including pharmacists, nurse practitioners and social workers. Modernizing physician compensation will address a widely recognized barrier to integrated and collaborative team-based primary care.27 It will also better align physician compensation with broader health system goals of achieving higher quality and more cost-effective care. This kind of innovation is long overdue and I hope to see more of it in the months and years to come. Read CCPA-BC’s recommendations for priorities and funding for health care in BC’s 2019 budget. Auditor General of British Columbia (2014), Oversight of Physician Services, p. 4. BC Ministry of Finance (2018), First Quarterly Report September 2018, p. 59. Auditor General of British Columbia (2013), Health Funding Explained, p. 16. Canadian Institute for Health Information, National Physician Database, 2015-2016, Table 1.2. Commission on the Future of Health Care in Canada (2002), Building on Values: The Future of Health Care in Canada – Final Report, p, 102. Hugh M. Grant and Jeremiah Hurley (2013), Unhealthy Pressure: How Physician Pay Puts the Squeeze on Health-Care Budgets, The School of Public Policy, University of Calgary, p. 11. Hugh M. Grant and Jeremiah Hurley (2013), Unhealthy Pressure: How Physician Pay Puts the Squeeze on Health-Care Budgets, The School of Public Policy, University of Calgary, p. 1. Canadian Institute for Health Information (2011), Health Care Cost Drivers: The Facts, p. vi. Statistics Canada, Table 14-10-0307-01, Employee wages by occupation, annual, retrieved November 24, 2018. 2016 average weekly wage rates are used and assumes 52 weeks of employment income. Richard Wilkinson and Kate Pickett (2009), The Spirit Level: Why More Equal Societies Almost Always Do Better. London: Penguin; Michael Marmot (2015), The Health Gap: The Challenge of an Unequal World, New York: Bloomsbury Press; Clare Bambra (2016), Health Divides: Where You Live Can Kill You, Bristol: Policy Press; Danny Dorling (2017), The Equality Effect: Improving Life for Everyone, Oxford: New Internationalist. See also: Hugh M. Grant and Jeremiah Hurley (2013), Unhealthy Pressure: How Physician Pay Puts the Squeeze on Health-Care Budgets, The School of Public Policy, University of Calgary, pp. 16-17. Author’s analysis of MSP Blue Book, https://catalogue.data.gov.bc.ca/dataset/msp-blue-book, retrieved November 11, 2018. Physician practice specialties were determined by cross-referencing the College of Physician and Surgeons of British Columbia’s Physician Directory available at https://www.cpsbc.ca/physician_search. The Medical Services Commission is a statutory committee made up Doctors of BC representatives, government officials, and public members with the responsibility of managing BC’s Medical Services Plan in a cost-effective manner. Auditor General of British Columbia (2014), Oversight of Physician Services, p. 30. The 2015/16 MSP billing data do not reflect the reduced cataract surgery fee implemented in 2018. Charles J. Wright, G. Keith Chambers, and Yoel Robens-Paradise (2002), Evaluation of indicators for and outcomes of elective surgery, CMAJ 167(5), pp. 461-466; Andrew Longhurst, Marcy Cohen, and Margaret McGregor (2016), Reducing Surgical Wait Times: The Case for Public Innovation and Provincial Leadership, Canadian Centre for Policy Alternatives—BC Office, pp. 17-18. See also Choosing Wisely Canada, https://choosingwiselycanada.org/. Jeremy Petch, Irfan A. Dhaka, David A. Henry, Susan E. Schultz, Richard H. Glazier, and Sacha Bhatia (2012), Public payments to physicians in Ontario adjusted for overhead costs, Healthcare Policy 8(2), p. 32. Calculated based on average ophthalmologist gross payments ($865,916) minus overhead of 42.5% equals $497,902. Average full-time BC worker earns approximately $55,776 annually. Lars Nielsen and Arthur Sweetman (2018), Measuring physicians’ incomes with a focus on Canadian-Controlled Private Corporations, Healthcare Papers 17(4), pp. 80-81. Lars Nielsen and Arthur Sweetman (2018), Measuring physicians’ incomes with a focus on Canadian-Controlled Private Corporations, Healthcare Papers 17(4), p. 77. Gregory P. Marchildon and Michael Sherar (2018), Doctors and Canadian medicare: Improving accountability and performance, Healthcare Papers 17(4), p. 17. Allie Peckham, Julia Ho, and Gregory Marchildon (2018), Policy Innovations in Primary Care Access Across Canada: A Rapid Review Prepared for the Canadian Foundation for Healthcare Improvement, pp. 5-6. Gregory P. Marchildon and Michael Sherar (2018), Doctors and Canadian medicare: Improving accountability and performance, Healthcare Papers 17(4). Auditor General of British Columbia (2014), Oversight of Physician Services, p. 8. Vanessa Brcic, Margaret J. McGregor, Janusz Kaczorowski, Shafik Dharamsi, Serena Verma (2012), Practice and payment preferences of newly practising family physicians in British Columbians, Can Fam Physicians 58: pp. e275-281. See also: Canadian Foundation for Healthcare Improvement (2010), Myth: Most physicians prefer fee-for-service payments. Marcy Cohen (2014), How Can We Create a Cost-Effective System of Primary and Community Care Built Around Interdisciplinary Teams? CCPA Submission to the Select Standing Committee on Health, Canadian Centre for Policy Alternatives—BC Office; Rick H. Glazier, Brandon. M. Zagorski, Jennifer Rayner (2012), Comparison of Primary Care Models by Demographics, Case Mix and Emergency Department Use, 2008/09 to 2009/10, Institute for Clinical Evaluative Sciences; Grant M. Russell, Simone Dahrouge, William Hogg, Robert Geneau, Laura Muldoon, Meltem Tuna (2012), Managing Chronic Disease in Ontario Primary Care: The Impact of Organizational Factors, Annals of Family Medicine 4, pp. 309-318. Marcy Cohen (2014), How Can We Create a Cost-Effective System of Primary and Community Care Built Around Interdisciplinary Teams? CCPA Submission to the Select Standing Committee on Health, Canadian Centre for Policy Alternatives—BC Office, pp. 14-16.